I'll start out by saying that if you liked the movies, then you really need to get down to the State Museum. 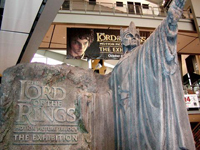 The Lord of The Rings motion picture exhibit has traveled the world and the fact that it has stopped here in Indy after visiting places like London and Sydney means that Indianapolis really does matter to some as a major city. Who knows - maybe we'll start getting national rock acts as well. I went to see this exhibit over the weekend. You are right about the exacting detail. Super impressive. The 'severed orc head' really got my attention. It was displayed so that you could get right up to it and look at it on eye level (many of displays were positioned so that you have to look up to really see them). Looking closely, you can actually see rotten bits of food (flesh?) between its teeth! There were even little hairs sticking out from its nose and ears. Oh yeah, you are NOT allowed to bring a camera into the exhibit. I borrowed a Digital Rebel with the intention of taking some great pics only to be stopped by the copyright police at the entrance. Yeah - I can imagine that the flash photography might be detrimental to the items themsevles (which is part of the reason why you can't take pictures in a museum filled with paintings). Plus imagine the backlog of people standing around and jockeying to get a good photo. does anyone know were i can find actual lord of the rings props for sale on the internet. I did a search myself many moons ago, Chris, and sad to say I didn't come up with anything. My logic was "they had tons of stuff for that movie - surely some of it is up for sale". There are plenty of reproduction and replica companies, but it's hard to say who has a legitimate liscense to produce the props. So is there anywhere to buy any original props used in the movies? They're pricey, but that's the only place I've see anything for sale. I have heard most of the trilogy props are in a warehouse in New Zealand, and lots of the actors, and staff took stuff, as well. I have an original prop from the first film. its Striders goblet from the scene in the inn where you first see him, hooded and smoking and drinking from this foblet. I won it in a BBC competition so have firm authentification by way of letters from the BBC and film company. Anyone got any guesses at its worth. I've had it since just after the films were released, but alas have been laid off, so need see if its worth selling. Hi this is somewhat of off topic but I was wanting to know if blogs use WYSIWYG editors or if you have to manually code with HTML. I'm starting a blog soon but have no coding know-how so I wanted to get advice from someone with experience. Any help would be greatly appreciated! my directory gradually by hand so that it retains top quality. Excellent read! I've updated your rss feeds to my Google account. Hey! Do you use Twitter? I'd like to follow you if that would be ok. I'm undoubtedly enjoying your blog and look forward to new updates. Good day my personal spouse! I wish to point out that benefits and drawbacks remarkable, good created and include close to almost all considerable infos. I must search extra threads this way . Хороший ремонт холодильников хорошо осуществит не пьющий холодильщик в удобное время во всех муниципалитетах подмосковья за не большую оплату Наш ресурс с расценками.